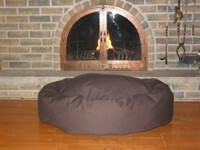 The Mammoth donut dog bed is for those dogs wanting the best rest on a cloud. Sold in three sizes from Pug size to Dobermans. Surround your dog in luxury with the abundant high memory upholstery fiber that supports large breeds. The covers remove to wash and the canvas is a breathable cotton that is durable. Sold here in five colors. Love this bed, used it for years. Quality is by far better then anything out there.